During my honeymoon in Barbados I spent a huge amount of time in the sun so I came back with a deep, glowing, golden brown tan. However, due to the eight and a half hour flight back to the UK I found my skin was extremely dry which is something I have never suffered with this badly before. 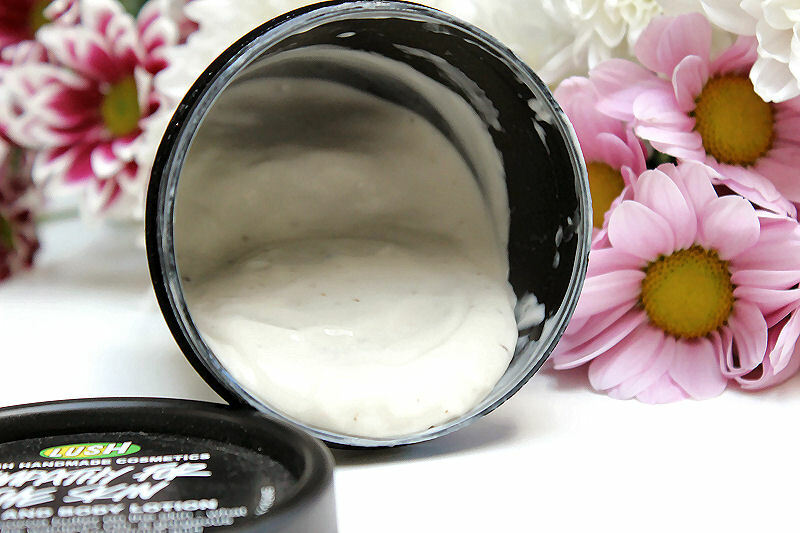 Usually I would rely on my Laura Mercier Body Creme Souffle, however, as I had very little left I needed an alternative. While I was away I used my Soap and Glory Smoothie Star which smells amazing (just like popcorn) but it just didn’t give me the hydration I needed which was disappointing. I needed an alternative. I didn’t want to spend a lot so I wasn’t looking for a high end brand but something that would nourish my skin so I turned to Lush. I’m a big fan of Lush products as they are natural, not tested on animals and there is so much variation so I was confident I would find something that would help. 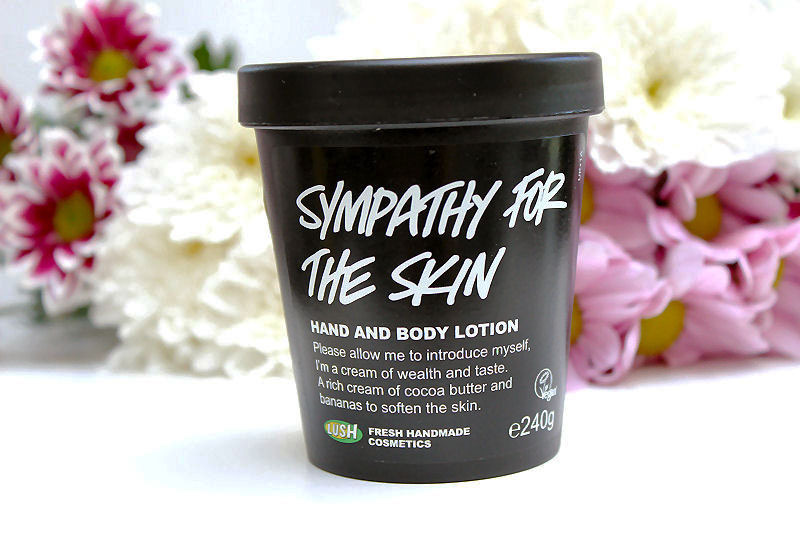 I wasn’t too sure where to start as I hadn’t actually used any moisturisers from Lush before so after seeking help from the staff I was recommended Sympathy for the Skin which is a combined hand and body lotion. 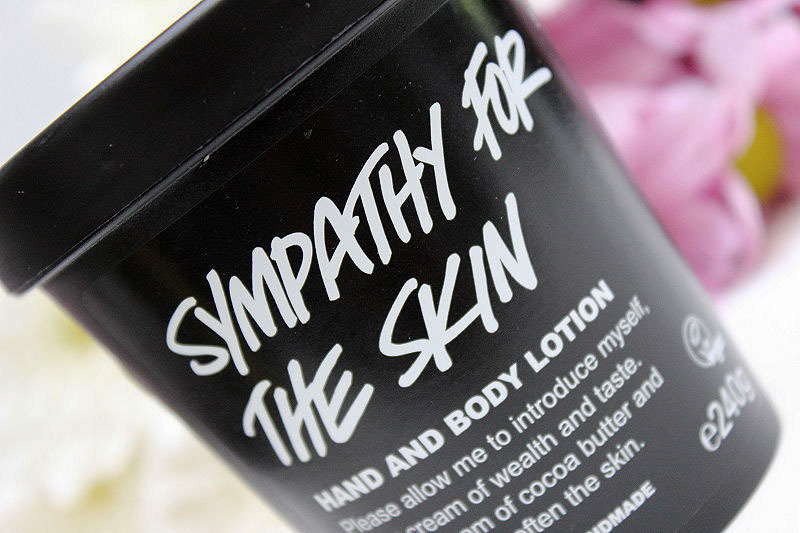 Sympathy for the Skin contains banana, cocoa butter, vanilla, lemon oil, labdanium and sandalwood. Combined these ingredients are said to condition, soften, uplift and sooth the skin due to their rich and nourishing properties plus they sound like they would smell delicious right? Unfortunately this wasn’t the case for me which was disappointing. I wasn’t expecting this review to turn out to be negative as before now there wasn’t one Lush product I didn’t get on with, however, this one just didn’t work for me. Firstly the scent is a little meh, It’s subtle, pleasant and not offensive in the slightest but I was expecting something that smelt scrumptious. Don’t get me wrong, this isn’t what I look for in a moisturiser and it’s not really important but I guess the point that I’m trying to make is that the scent just isn’t what I would expect from the list of ingredients. That aside, if this product had wowed me the scent wouldn’t have bothered me in the slightest, after all how it works is what is important but it just didn’t suit my skin type. My skin is relatively sensitive and I didn’t get any irritation which was brilliant but I found the formula to be a little greasy. It left a sheen on my skin which didn’t absorb so it’s not a moisturiser to use if you are in a rush. It also didn’t seem to have any long lasting affects on my dry skin. I ended up applying it three times a day as shortly after use my skin would be dry again but this sadly this made no difference. After doing this for a week and my skin actually getting dryer rather than more hydrated I turned to my Laura Mercier Souffle. 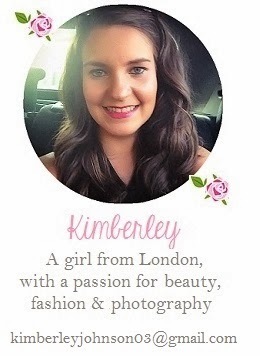 After just one application, hours later my skin still looked moisturised and I could really see a difference. Even though it’s expensive I think I’ll be sticking to my old favourite in the future! I actually end up using less of it as I don’t have to apply it so many times a day! What do you think of this moisturiser? What is your favourite? Ah man it's always annoying when something doesn't work out, especially when lush things are not the cheapest of items! Don't think this is one I'll be picking up then! Such a shame. Oh bad! that it didn't work out for you. best article.I really love how it is easy on my eyes and the data are well written.